Has a culture of caring for their employees. We get to know the company (their business, their core values, their benefits philosophy and the specifics of their retirement plan) and we get to know their employees (their retirement readiness and financial acumen). We recommend an investment menu for the plan; monitor and benchmark the performance of the menu on an ongoing basis; recommend changes to the menu as needed; and assist employees in choosing appropriate investments from that menu, consistent with their own goals and circumstances. 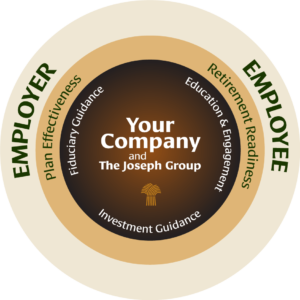 We empower employees to own their own retirement readiness via financial education seminars; group and one on one meetings; and personal financial coaching.